Couldn't really find a place to put this ... since it isn't "Solar System". Draggen ... think maybe change the title to reflect "Universe" ? 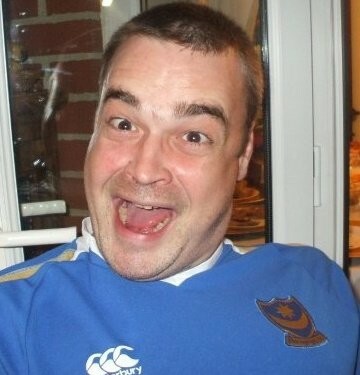 Or am I missing a more appropriate ongoing thread for this kind of awesomeness? Ohhh SNAP. They know where to look now. 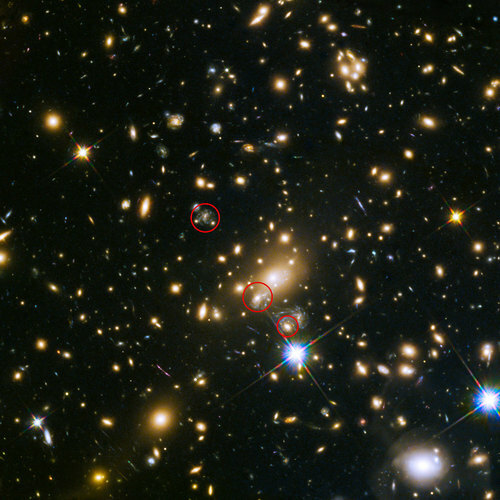 Problem is, it could happen tomorrow or 1,000 years -- just like any other Supernova. If one knows particulars of the "various lenses" in the general path, you may be able to narrow down the time frame considerably. Close-up of features in Ganges Chasma, close to Aurorae Chaos. 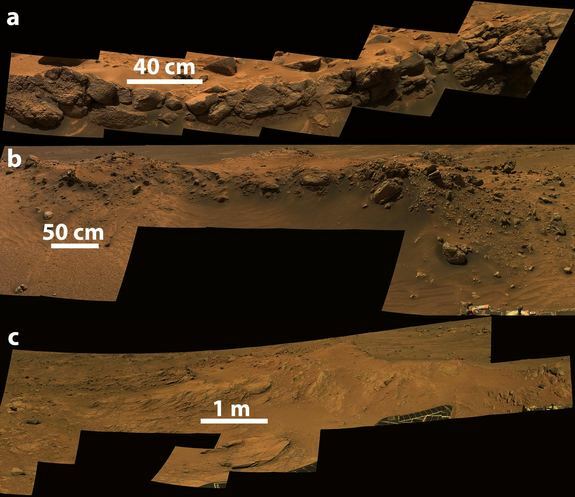 The image focuses on the valley walls in this region, which show evidence for slumping and landslides. Material closest to the valley floor shows a stepped morphology, which could reflect different water or ice levels over time. Small channels are observed on the cliff tops. Image courtesy ESA/DLR/FU Berlin, CC BY-SA 3.0 IGO. For a larger version of this image please go here. 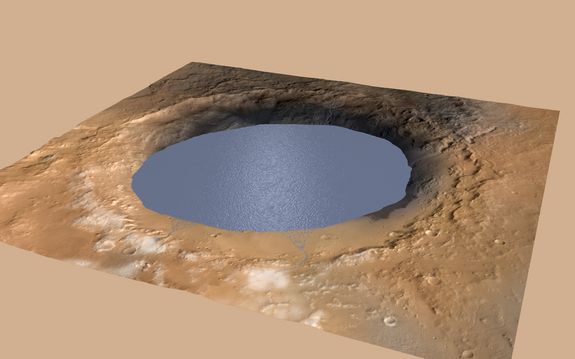 Vast volumes of water once flooded through this deep chasm on Mars that connects the 'Grand Canyon' of the Solar System - Valles Marineris - to the planet's northern lowlands. The image, taken by ESA's Mars Express on 16 July, focuses on Aurorae Chaos, close to the junction of Ganges, Capri and Eos Chasmata. 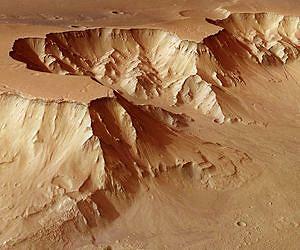 The region is rich in features pointing to wet episodes in the history of the Red Planet. Dominating the southern (left) portion of the scene are numerous jumbled blocks - 'chaotic terrain', believed to form when the surface collapses in response to melting of subsurface ice and the subsequent sudden release of water. However, the cliff tops display small channels and the walls show evidence of slumped material or landslides - best seen in the perspective view. Material closest to the main chasma floor appears stepped, which could reflect different water or ice levels over time. This region is just a small subsection of a huge system of interconnected valleys and flood channels that emptied water into the northern plains, and which were most likely active in the first 1-2 billion years of Mars' history. 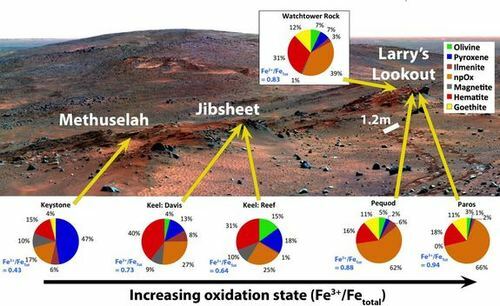 Although extremely small amounts of water would quickly evaporate inMars' low-pressure atmosphere, water from sources such as aquifers could last long enough to pool, with larger pools remaining liquid for at least a year, researchers said. An expanded view of comet C/2006 W3 (Christensen) is shown here. The WISE spacecraft observed this comet on April 20th, 2010 as it traveled through the constellation Sagittarius. Image courtesy NASA/JPL-Caltech. After its launch in 2009, NASA's NEOWISE spacecraft observed 163 comets during the WISE/NEOWISE prime mission. 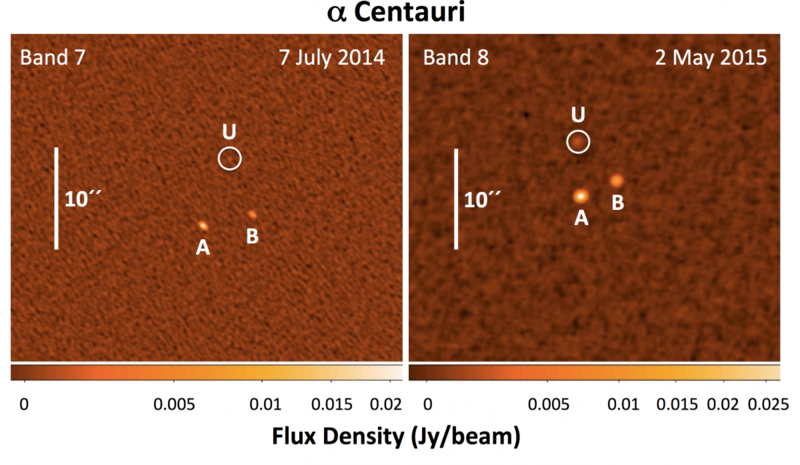 This sample from the space telescope represents the largest infrared survey of comets to date. Data from the survey are giving new insights into the dust, comet nucleus sizes, and production rates for difficult-to-observe gases like carbon dioxide and carbon monoxide. Carbon monoxide (CO) and carbon dioxide (CO2) are common molecules found in the environment of the early solar system, and in comets. In most circumstances, water-ice sublimation likely drives the activity in comets when they come nearest to the sun, but at larger distances and colder temperatures, other common molecules like CO and CO2 may be the main drivers. Spaceborne carbon dioxide and carbon monoxide are difficult to directly detect from the ground because their abundance in Earth's own atmosphere obscures the signal. The NEOWISE spacecraft soars high above Earth's atmosphere, making these measurements of a comet's gas emissions possible. "This is the first time we've seen such large statistical evidence of carbon monoxide taking over as a comet's gas of choice when they are farther out from the sun," said James Bauer, deputy principal investigator of the NEOWISE mission from NASA's Jet Propulsion Laboratory in Pasadena, California, and author of a paper on the subject. "By emitting what is likely mostly carbon monoxide beyond four astronomical units (4 times the Earth-Sun distance; about 370 million miles, 600 million kilometers) it shows us that comets may have stored most of the gases when they formed, and secured them over billions of years. "Most of the comets that we observed as active beyond 4 AU are long-period comets, comets with orbital periods greater than 200 years that spend most of their time beyond Neptune's orbit." "As they get closer to the sun, these comets seem to produce a prodigious amount of carbon dioxide," said Bauer. "Your average comet sampled by NEOWISE would expel enough carbon dioxide to provide the bubble power for thousands of cans of soda per second." This is an artistic impression of how auroras could be more widespread under a geomagnetic field much weaker than today's. Image courtesy Huapei Wang, with source files courtesy of NASA's Earth Observatory/NOAA/DOD. The intensity of earth's magnetic field has been weakening in the last couple of hundred years, leading some scientists to think that its polarity might be about to flip. But the field's intensity may simply be coming down from an abnormal high rather than approaching a reversal, scientists write in a new paper in the Proceedings of the National Academy of Sciences. Humans have lived through dips in the field's intensity before, and there are debates about whether reversals in the more distant past had any connection to species extinctions. Today, we have something else today that would be affected by weakening of the magnetic field alone: technology. The magnetic field deflects the solar wind and cosmic rays. When the field is weaker, more radiation gets through, which can disrupt power grids and satellite communications. "The field may be decreasing rapidly, but we're not yet down to the long-term average. In 100 years, the field may even go back the other direction [in intensity]," said Dennis Kent, an expert in paleomagnetism at Columbia University's Lamont-Doherty Earth Observatory and co-author of the study with his former student, Huapel Wang, now a post-doctoral research associate at MIT, and Pierre Rochette of Aix-Marseille Universite. The scientists used a new technique to measure changes in the magnetic field's strength in the past and found that its long-term average intensity over the past five million years was much weaker than the global database of paleointensity suggests - only about 60 percent of the field's strength today. The findings raise questions both about claims that the magnetic field may be nearing a reversal and about the database itself. The study's results fit expectations that the magnetic field's intensity at the poles should be twice its intensity at the equator. In contrast, the time-averaged intensity calculated from the PINT paleointensity database doesn't meet the two-to-one, poles-to-equator dipole hypothesis, and the database calculation suggests that the long-term average intensity over the past 5 million years is similar to the field's intensity today. The authors believe the difference is in how the samples are analyzed. They say the database, which catalogs paleointensity data from published papers, includes a variety of methods and doesn't clearly delineate data from two different types of magnetized mineral samples, tiny single-domain grains that come from sites that cooled quickly, like basalt glass on the outer edges of lava flows, and more common larger multi-domain grains found deeper inside lava whose magnetic behavior is more complex and require a different type of analysis. Earth's magnetic poles have reversed several hundred times over the past 100 million years, most recently about 780,000 years ago. Some scientists believe a dip in the magnetic field's intensity 41,000 years ago was also a brief reversal. 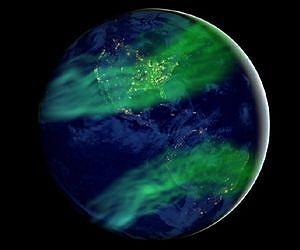 When scientists recently began noticing a decline in the magnetic field - about 10 percent over the past two centuries - it led to speculation that another reversal could be coming. That doesn't mean it would happen quickly, if it happens at all. The magnetic field's intensity rises and dips without a clear pattern, only sometimes dipping far enough to become unstable and possibly reverse. During a reversal, geomagnetic intensity declines during a transition period that typically lasts hundreds to thousands of years, then rebuilds. For the new study, the scientists used ancient lava flows from sites near the equator and compared the paleointensity data with what had been regarded as an anomalously low intensity obtained by others from lavas from near the South Pole. As lava cools, iron-bearing minerals form inside and act like tiny magnets, aligning with the Earth's magnetic field. Scientists can analyze ancient lava to determine both the direction and the intensity of the magnetic field at the time the lava formed. For the new study, the scientists used ancient lava flows from sites near the equator and compared the paleointensity data with from lavas collected near the South Pole. As lava cools, iron-bearing minerals form inside and act like tiny magnets, aligning with the Earth's magnetic field. Scientists can analyze ancient lava to determine both the direction and the intensity of the magnetic field at the time the lava formed. The scientists used a new technique for analyzing multi-domain samples. They worked with a representative range from the past 5 million years using 27 lavas from the Galapagos Islands, about 1 degree of latitude from the equator. 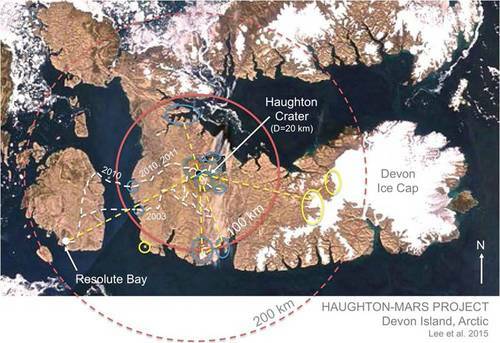 The results were then compared to those from 38 lavas with single-domain properties from a volcanic area near McMurdo Station in Antarctica, about 12 degrees from the South Pole. When they averaged the geomagnetic intensity of each set, it revealed close to a two-to-one intensity difference between the polar site and the equatorial site, fitting the geocentric axial dipole (GAD) hypothesis, on which most paleogeographic reconstructions rely. The results show that the time-averaged geomagnetic field intensity over the past 5 million years is about 60 percent of the field's intensity today and aligns with the GAD hypothesis, both in direction and intensity. Other studies using only single-domain basalt glass from the ocean floor have found a similar time-averaged intensity, but they did not have samples to test the polar-equator ratio. The agreement helps to validate the new multiple-domain analysis technique, Kent said. The lower time-averaged paleointensity also suggests a shorter average magnetopause standoff distance--the distance at which the Earth's magnetic field repels the solar wind. The average is about 9 times the Earth's radius compared to nearly 11 times the Earth's radius today, according to the paper. A shorter standoff distance results in stronger radiation at Earth's surface and in the atmosphere, causing more frequent low-latitude auroras. Credit: D. Savransky and J. Bell (Cornell) / JPL / NASA, annotated by S. Cole. Gravitational interactions of small bodies with the Earth-Moon system shortly after its formation (artist's depiction). The mysterious tilt of the moon's orbit is due to gravitational tugs it received from giant, close-passing rocks that eventually slammed into the Earth, new research suggests. The leading explanation for the moon's origin is that a Mars-size rock called Theia struck the newborn Earth about 4.5 billion years ago, and the moon coalesced from the disk of debris that resulted from this crash. The early solar system was full of giant rocks hurtling around it and later colliding with Earth and the other planets. Before these giant rocks smacked into Earth, they each typically experienced thousands of close passes with the planet, a portion of which might have brought them close enough to Earth or the moon to strongly perturb the moon's orbit with their gravitational pull. 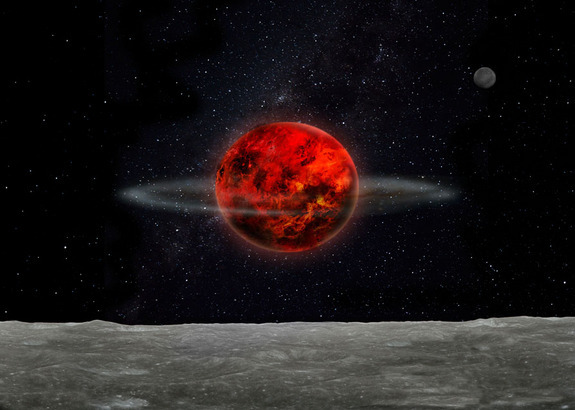 The researchers found that there was a high chance that, a few tens of millions of years after lunar formation, these close passes could have given the moon's orbit the tilt seen today. "The most surprising thing about these results is the ease with which the moon's orbital trajectory can be tilted, or excited, by gravitational interactions with passing objects," Kaveh Pahlevan, a planetary scientist at the Observatory of the Côte d'Azur in Nice, France, and lead author of the study, told Space.com. 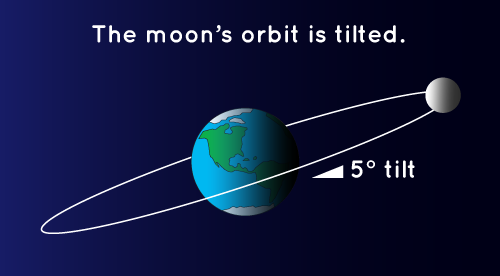 The moon is tilted with respect to the Earth's orbital plane. These findings suggest that the giant impact that formed the moon occurred near the end of Earth's formation. "If the moon-forming event had occurred earlier, when more massive bodies were around, the moon's orbit would have been much more excited and likely destabilized, with the moon colliding with the Earth or escaping to interplanetary space," Pahlevan said. "The relative lateness of the moon-forming event during Earth formation can be understood as a necessity for its survival. Earlier moons were simply lost." These findings also support previous research suggesting that giant rocks delivered a "late veneer" of metals onto Earth, adding about the last 1 percent of the planet's mass. Gold, platinum, iridium and certain other metals are highly siderophile, meaning they have a strong chemical affinity for iron. Because the newborn Earth was largely molten, most of the planet's iron sunk to its core, and this iron should have taken most of Earth's highly siderophile elements with it. The fact that such metals are found in relatively high levels on Earth's surface suggests they were delivered by giant impacts from many massive rocks, after Earth's core finished forming. "Had such a population of objects not existed, the moon might be orbiting in Earth's orbital plane, with total solar eclipses occurring as a spectacular monthly event," Robin Canup, a planetary scientist at the Southwest Research Institute, wrote in a commentary article about this research, published in the journal Nature. "But our jewelry would be much less impressive — made from tin and copper, rather than from platinum and gold." The vulnerability of planet-moon systems to gravitational disruption from outside bodies might help to explain some mysterious features of the inner solar system, Pahlevan said. 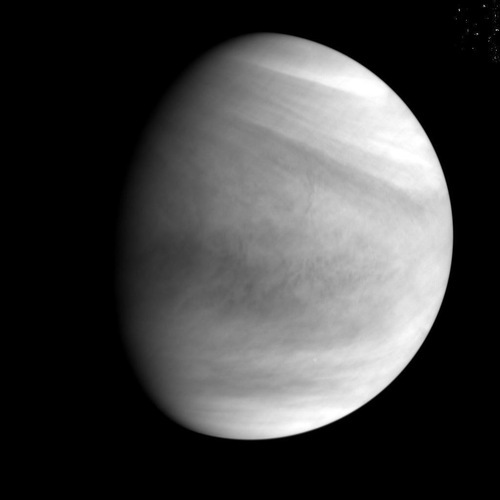 For instance, Venus likely experienced the same kind of giant impacts that created Earth's moon, but it has no moon, and —strangely — spins very little on its axis. 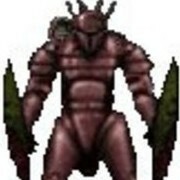 "Could these Venusian features be the outcome of a planet-satellite system that was destabilized by strong collisionless encounters?" Pahlevan said. "That is a topic for future research." Pahlevan and senior co-author Alessandro Morbidelli, of the Observatory of the Côte d’Azur, detailed their findings in the Nov. 26 issue of the journal Nature. This filament eruption was followed by a second filament breaking away on Nov. 16. Filaments are dark strands of plasma tethered above the sun's surface by magnetic forces that, over time, often become disrupted and break away from the sun. Filaments appear darker than the surrounding material because of their comparatively cool temperature. This video was taken in extreme ultraviolet wavelengths of 304 angstroms and colorized in red. The small ring particles are too tiny to retain internal heat and have no way to get warm, so they are frozen and geologically dead. 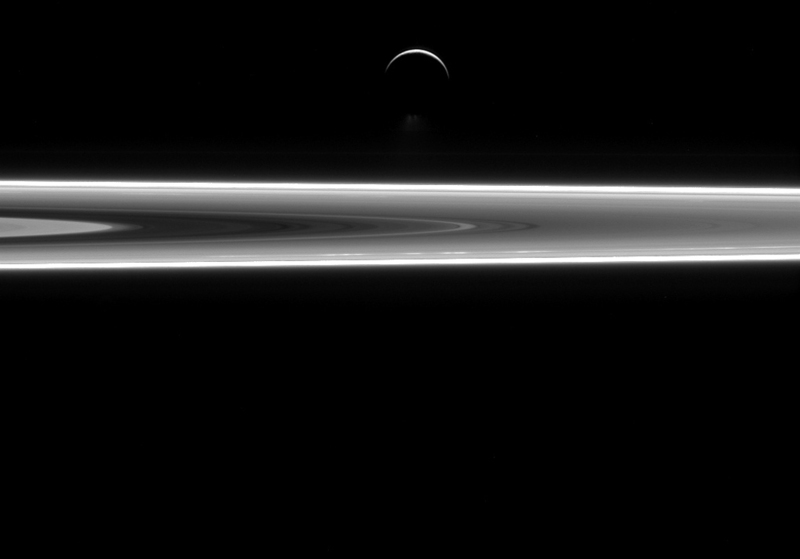 Enceladus, on the other hand, is subject to forces that heat its interior to this very day. This results in its famous south polar water jets, which are just visible above the moon's dark, southern limb, along with a sub-surface ocean. Recent work by Cassini scientists suggests that Enceladus (313 miles or 504 kilometers across) has a global ocean of liquid water under its surface. This discovery increases scientists' interest in Enceladus and the quest to understand the role of water in the development of life in the solar system. A University of Alberta researcher has successfully generated 3D simulations of deep jet streams and storms on Jupiter and Saturn, helping to satiate our eternal quest for knowledge of planetary dynamics. The results facilitate a deeper understanding of planetary weather and provide clues to the dynamics of Earth's weather patterns evidenced in jet streams and ocean currents. 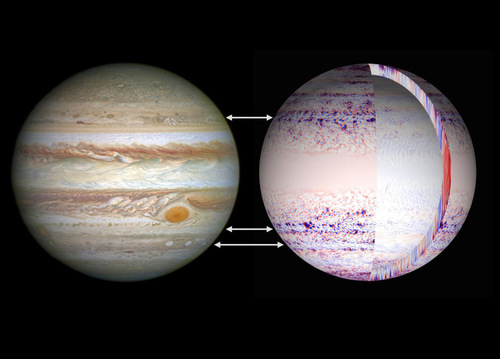 "Since the pioneering telescope observations of Giovanni Cassini in the mid-17th century, stargazers have wondered about the bands and spots of Jupiter," says Moritz Heimpel, a physics professor at the University of Alberta whose study produced the simulations of the observable phenomena. The bands he references indicate jet streams while the spots signify storms; Heimpel is studying the dynamics between the two. "The average citizen can now pick up a backyard telescope and see the structures that we write about today. However, even in the present age with the Cassini spacecraft orbiting Saturn and the Juno craft approaching Jupiter, there is considerable debate about the dynamics of the atmospheres of the giant planets." Heimpel notes that despite 350 years of observation, the origin and dynamics of planetary jet streams and vortices or planetary storms remain debated. Shallow weather layer simulations have struggled to adequately reproduce the jet streams on Jupiter and Saturn, while previous deep-flow models have not reproduced vortices. Heimpel and his colleagues have taken this challenge to the next level, using fluid dynamics equations and supercomputers to produce more realistic simulations that give insight into the origin of both features. "One of the big questions we have is how deep do these structures go?" says Heimpel. "These storms are embedded in these jet streams, and there's no solid surface to stop them. Our simulations imply that the jet streams plunge deep into the interior, while the storms are rather shallow." Unlike great storms on Earth, which eventually lose steam after encountering land mass, planetary storms can continue for centuries. "At its core, our research is curiosity-based, and our ideas are driven by observations. 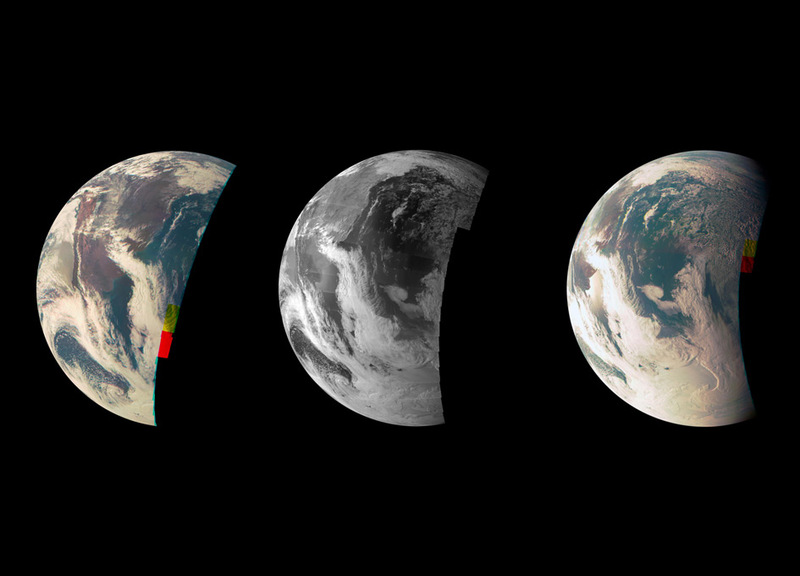 We have a wealth of those from NASA space missions and ground-based telescopes," says Heimpel. "Now we want match the observations with the theory." Heimpel notes that he and his colleagues will push their research even further in the coming year with the Juno spacecraft arriving in one of Jupiter's polar orbits in the summer of 2016 and the Cassini mission--in its final phase--moving into a polar orbit of Saturn in 2017. "These two missions will be key to verifying some of the predictions of our computer simulations. And more importantly, the missions will lead to new questions and controversies that we will address with ever more sophisticated analysis." Heimpel and his group at the University of Alberta are one of only a few teams in Canada that use high-powered supercomputers to solve problems in global atmospheric and interior dynamics of the planets. The group is part of Compute Canada, a nationalized system of resource-sharing across universities. 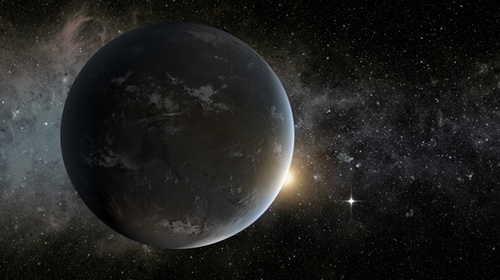 For this paper, Heimpel teamed up with two researchers--Thomas Gastine and Johannes Wicht--from the Max Planck Institute for Solar System Research in Germany. The findings, "Simulation of deep-seated zonal jets and shallow vortices in giant gas atmospheres," were published in the journal Nature Geoscience. Twenty years ago, the Solar and Heliospheric Observatory launched into space and revolutionized our study of the sun and a scientific discipline called heliophysics. Heliophysics is the study of how the sun's influence spreads out in all directions, able to dramatically affect the space environment near Earth and throughout the solar system. But the field was far from its infancy when that observatory, also called SOHO, launched on Dec. 2, 1995. In fact, it can trace its roots back to Thomas Harriot, who first saw sunspots through a telescope in 1610. The study really took off about 130 years ago following Dutch astronomer Pieter Zeeman's discovery that a magnetic field, or a field of force generated by electrical currents, alters some spectral lines. Within a decade, American astronomer George Ellery Hale used Zeeman's discovery to demonstrate that sunspots contained strong magnetic fields. But it took NASA missions to get off the ground literally. "When you can get your instrument above the atmosphere, you begin to be able to see things you couldn't see before," said Keith Strong, heliophysicist emeritus at NASA's Goddard Space Flight Center in Greenbelt, Maryland. Goddard heliophysicist Joe Gurman said gathering observations from above the atmosphere was one of the first science goals of NASA as an agency and an absolute necessity for studying the sun because Earth's atmosphere absorbs or deflects much of the light the sun emits: most ultraviolet radiation, X-rays and gamma-rays. After World War II, when there was a growing recognition of solar activity's influences on radio frequency propagation in Earth's upper atmosphere, scientists began to study that activity more intensively. They used leftover German rockets to soar above Earth's atmosphere to measure emission in wavelength ranges absorbed by atmospheric gases, and found that the sun's ultraviolet radiation varied wildly from year to year. But these rocket missions were limited. They could only launch to the edge of space for five to 10 minutes, and though they got marginally better over the years, it still wasn't enough. Scientists needed something capable of long-term observation, so NASA developed spacecraft called the Orbiting Solar Observatories to study solar activity. The OSO satellites, eight spacecraft launched between March 1962 and June 1975, performed solar physics experiments over a complete solar cycle of 11 years, during which the sun transitions from the most solar activity to the least. "The things that came out of those missions were just groundbreaking for what we've been doing since," Gurman said. From the resulting data, scientists were able to begin to understand the structure of the upper solar atmosphere, study disturbances in the solar atmosphere and more. In the early 1960s, a whole scientific field helioseismology began to form around new observations of oscillations occurring on the solar surface. European Space Agency heliophysicist Bernhard Fleck, who is based at Goddard believes one of the most significant advancements in solar physics in the 20th century was the discovery of global oscillations, or pressure waves, in the sun. Those oscillations could be used to probe the structure of the sun's interior, a process analogous to a sonogram of the sun. Previously, scientists could only speculate about what was going on inside the sun. Solar scientists wondered whether sound waves driven by such oscillations might provide the energy source to heat the corona, the sun's tenuous outer atmosphere, which is actually much hotter than the visible surface of the sun. Measurements in 1976 with OSO-8, the final OSO mission, however, demonstrated that the sound waves in the upper solar atmosphere contained far too little energy to heat the corona. OSO was just the beginning. The OSO results led to heliophysics experiments on Skylab, America's first space station, launched in 1973. On Skylab, astronauts operated a battery of telescopes to learn more about variability of the extreme ultraviolet and X-ray emission from the corona. "Unfortunately, they also learned that using a human-operated telescope wasn't very effective," Gurman said. "They nearly always missed the beginning of the flare, which is when the interesting physics happens." Still, Skylab captured the imagination of solar scientists. 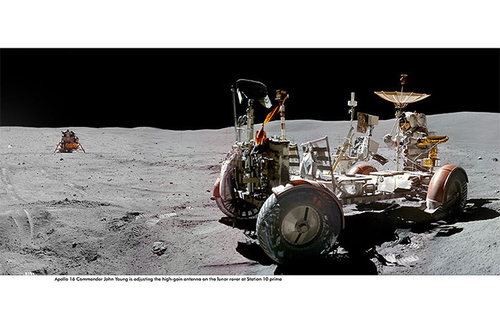 Indeed, Strong said it was Skylab's high-resolution images of the sun that inspired him when he was in college. Shortly after the end of Skylab, he joined the team of the next big solar spacecraft, the Solar Maximum Mission, at Goddard in 1980. The Solar Maximum Mission improved upon the Skylab telescopes by using automated flare detection to digitally coordinate all the instruments to direct to the flare within a fraction of a second. Ultimately, these early missions laid the groundwork for missions like SOHO. A cooperative effort between NASA and the European Space Agency, SOHO studies the internal structure of the sun, its outer atmosphere and the origin of solar wind, the stream of ionized gas that blows continuously outward into the solar system. SOHO offered the first 24/7 view of the giant explosions on the sun, called coronal mass ejections or CMEs, and made us aware for the first time of the sun's effect on the technological world. Taken together, flares, CMEs, and solar energetic particles constitute space weather, which in extreme cases can cause power grids and communications systems like GPS to fail. "It has an impact directly on life," Strong said. "For example, you can't lay oil pipelines very accurately beneath the sea during times that your GPS doesn't work." These generations of solar spacecraft have helped to solve a number of mysteries surrounding the sun, but they also raised more questions. Unlike in the early days of NASA, the agency currently flies multiple spacecraft to study the sun and its effects on the solar system, providing a range of different observations. The Solar Terrestrial Relations Observatory, or STEREO, launched in October 2006, explores the sun-Earth system, tracing the flow of energy and matter from the sun to Earth. The dual spacecraft of the observatory made 3-D imaging of the sun possible for the first time. Another mission, the Solar Dynamics Observatory, launched in 2010, observes the solar atmosphere and makes helioseismology measurements, continuously returning incredibly high-resolution images at a rapid pace of 135 megabits per second to help understand the causes of solar variability and its effect on Earth. An upcoming mission called Solar Probe Plus, scheduled to launch in 2018, will be humanity's first voyage to a star, exploring the sun's outer atmosphere from as close as 3.7 million miles from the sun's surface,. That is a tenth the distance from the sun to Mercury, far closer than any spacecraft has ever gone. SOHO and NASA's heliophysics missions throughout the decades have built the foundation for NASA to begin answering the hardest questions about the sun and its effect on the solar system. After 20 years in space, ESA and NASA's Solar and Heliospheric Observatory, or SOHO, is still going strong. Originally launched in 1995 to study the sun and its influence out to the very edges of the solar system, SOHO revolutionized this field of science, known as heliophysics, providing the basis for nearly 5,000 scientific papers. SOHO also found an unexpected role as the greatest comet hunter of all time-reaching 3,000 comet discoveries in September 2015. "SOHO changed the popular view of the sun from a picture of a static, unchanging object in the sky to the dynamic beast it is," said Bernhard Fleck, ESA SOHO project scientist at NASA's Goddard Space Flight Center in Greenbelt, Maryland. Even the concept of space weather-now defined to encompass any events or conditions stemming from the sun that can affect space-borne and ground-based technological systems and through these, human life and endeavors-wasn't well-understood when SOHO launched. At the time, it was thought that solar flares were the primary Earth-effective solar event, in part because they were the most commonly-observed. Thanks to SOHO's coronagraph-a type of camera that uses a solid disk to block out the bright face of the sun to better observe the comparatively faint solar atmosphere, known as the corona-today we know that giant clouds that burst off the sun called coronal mass ejections, or CMEs, are a major piece of the space weather puzzle. Though two space-based coronagraphs preceded the one on SOHO, neither provided the same quantity or quality of observations. "Many faint CMEs had escaped notice on older coronagraphs," said Joe Gurman, US project scientist for SOHO at Goddard. "In light of the SOHO data, we realized CMEs are much more common-and more variable throughout the solar cycle-than we thought." CMEs, which are huge, fast-moving clouds of electrically-charged solar material that contain embedded magnetic fields, can cause geomagnetic storms when they collide with Earth's magnetic field, causing it to shimmy and shake. The ability to connect the effects of geomagnetic storms-like auroras, GPS and communication disturbances, and geomagnetically induced currents, which can put a strain on power grids-to events on the sun has brought the idea of space weather into the mainstream. "Thanks to SOHO, there's a growing public recognition that we live in the extended atmosphere of a magnetically active star," said Gurman. "And people realize that solar activity can affect Earth." But SOHO's coronagraph wasn't the only game-changing instrument. Before SOHO launched, carrying the Extreme ultraviolet Imaging Telescope, or EIT, the only cameras taking images of the sun in extreme ultraviolet light-which Earth's atmosphere blocks, making it impossible to observe from the ground-were on suborbital sounding rockets, which collect data for only minutes at a time. "For the first time ever, we saw waves rippling across the sun at a million miles an hour in extreme ultraviolet light," said Alex Young, a space scientist at Goddard. These tsunamis on the solar surface-still known by many as EIT waves, after the instrument that first observed them-happen in close conjunction with CMEs. Before the discovery of solar tsunamis, scientists often had no way of knowing if a CME was heading directly toward or directly away from Earth, since all CMEs on the Earth-sun line simply appear in coronagraph images as a giant halo around the sun. Scientists almost missed out on this and SOHO's other discoveries. In 1998, the spacecraft was lost for four months because of a software error. A joint ESA/NASA team was finally able to recover the spacecraft in September 1998, in part using the giant Arecibo radio telescope to locate the spacecraft and reestablish command. This rescue was crucial for heliophysics, as much of SOHO's scientific success can be attributed to its 20 years of near-constant observation. "With SOHO, we found that the sun varies on every timescale we can measure," said Gurman. "Whether it's 20 years or just a few milliseconds, we discover new phenomena." Though it expanded our knowledge of every facet of heliophysics, SOHO was launched to answer three primary questions. First-what is the interior structure of the sun? Though scientists had developed theories about the layers of ionized gas and complex magnetic field that compose our nearest star, they had no way of confirming their ideas other than by observing the sun's surface. But SOHO carries onboard an instrument that can take a kind of solar sonogram, helping researchers understand the sun's internal structure. This helped to solve what was known as the solar neutrino problem, in which the number of a certain type of solar neutrino observed at Earth didn't jibe with the number predicted by our theories about the sun. "Getting an accurate picture of the interior structure of the sun confirmed our theories about the number of neutrinos it emits," said Fleck. "That proved the solar neutrino problem came from a misunderstanding of neutrinos themselves-not the sun." The second question SOHO was designed to answer was that of solar wind acceleration. The sun is constantly losing material in all directions, but the speed of that flowing material-known as the solar wind-is much higher than one would expect from a relatively simple view of the sun. SOHO's observations showed how some of the fastest solar wind streams are accelerated in coronal holes, areas on the sun where the magnetic field is open to interplanetary space. As of yet, no one has managed to definitely answer SOHO's third question-what causes the extraordinarily high temperatures in the sun's atmosphere, the corona? "The corona is incredibly hot, hundreds of times hotter than the layers below," said Fleck. "Since the sun's source of energy is at the center, on a simple level, we would expect the corona-the outermost layer-to be the coolest." Though SOHO's observations have provided the basis for many possible explanations for the coronal heating problem, as it's known, it still hasn't been settled. However, NASA's Solar Probe Plus mission, planned for launch in 2018, will fly closer to the sun than any other spacecraft in order to investigate this very question. Solar Probe Plus is one of many missions that has been shaped by SOHO and its discoveries. Others include NASA's Solar Dynamics Observatory, NASA's Solar and Terrestrial Relations Observatory, and NASA's Interface Region Imaging Spectrograph, and JAXA/NASA's Hinode. "Without SOHO, there would be no SDO, no STEREO, no IRIS, no Hinode," said Young. "SOHO showed us things we'd never seen before, and then we realized we needed more eyes on the sun." A University of Montana professor who studies astrophysics has discovered how water ions escape from Saturn's environment. His findings recently were published in the journal Nature Physics. UM Professor Daniel Reisenfeld is a member of the Cassini research team. Cassini is a NASA-managed probe that studies Saturn. It has been in orbit continuously collecting data since 2004. One of the instruments on Cassini measures the planet's magnetosphere - the charged particles, known as plasma, that are trapped in the space surrounding Saturn by its magnetic field. One of Cassini's past discoveries is that Saturn's plasma comprises water ions, which are derived from Saturn's moon Enceladus, which spews water vapors from its Yellowstone-like geysers. Knowing that the water ions would not be able to accumulate indefinitely, the team of researchers set out to explain how the water ions escape from Saturn's magnetosphere. The answers to this phenomenon were published by Nature Physics in an article titled "Cassini in situ observations of long-duration magnetic reconnection in Saturn's magnetotail." In the paper, the authors explain that the plasma found a place to exhaust out of the magnetosphere at a reconnection point - basically where magnetic fields from one environment disconnect and reconnect with magnetic fields from another environment. In the case of Saturn, researchers discovered the reconnection point was located at the back of the planet, where the magnetotail was connecting with the solar winds' magnetic field. Reisenfeld likens the situation to a rotary or a traffic circle. Once you get into the rotary you have limited exit points. "If you can't find the exit, you keep going around in circles," he said. "So, the plasma around Saturn is basically trapped to go around the rotary. We assumed it had to escape somehow and somewhere, but actually finding the jettison point is pretty cool." Saturn is a very rapidly rotating planet. This discovery will help scientists understand the physics of how other rapid rotators such as Jupiter, stars and pulsars expel their materials and the details of how it works. "It's very exciting to have discovered this reconnection location because reconnection is one of the holy grails of plasma physics," Reisenfeld said. Dawn will be so near the dwarf planet that its sensors will detect only a small fraction of the vast territory at a time. An intrepid interplanetary explorer is now powering its way down through the gravity field of a distant alien world. 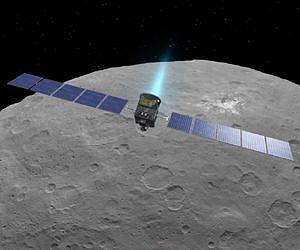 Soaring on a blue-green beam of high-velocity xenon ions, Dawn is making excellent progress as it spirals closer and closer to Ceres, the first dwarf planet discovered. Meanwhile, scientists are progressing in analyzing the tremendous volume of pictures and other data the probe has already sent to Earth. Dawn's spiral descent from its third mapping orbit (HAMO), at 915 miles (1,470 kilometers), to its fourth (LAMO), at 240 miles (385 kilometers). The two mapping orbits are shown in green. The color of Dawn's trajectory progresses through the spectrum from blue, when it began ion-thrusting in HAMO, to red, when it arrives in LAMO. The red dashed sections show where Dawn is coasting for telecommunications. Dawn is flying down to an average altitude of about 240 miles (385 kilometers), where it will conduct wide-ranging investigations with its suite of scientific instruments. The spacecraft will be even closer to the rocky, icy ground than the International Space Station is to Earth's surface. The pictures will be four times sharper than the best it has yet taken. The view is going to be fabulous! This composite image shows an infrared view of Saturn's moon Titan from NASA's Cassini spacecraft, acquired during the mission's ''T-114'' flyby on Nov. 13, 2015. The spacecraft's visual and infrared mapping spectrometer (VIMS) instrument made these observations, in which blue represents wavelengths centered at 1.3 microns, green represents 2.0 microns, and red represents 5.0 microns. A view at visible wavelengths (centered around 0.5 microns) would show only Titan's hazy atmosphere (as in Titan Up Front). The near-infrared wavelengths in this image allow Cassini's vision to penetrate the haze and reveal the moon's surface. Due to the changing Saturnian seasons, in this late northern spring view, the illumination is significantly changed from that seen by VIMS during the "T-9" flyby on Dec. 26, 2005 . The sun has moved higher in the sky in Titan's northern hemisphere, and lower in the sky in the south, as northern summer approaches. This change in the sun's angle with respect to Titan's surface has made high southern latitudes appear darker, while northern latitudes appear brighter. For more information about the Cassini-Huygens missionhttp://saturn.jpl.nasa.gov/home/index.cfm. The visual and infrared mapping spectrometer team homepage is at http://www.vims.lpl.arizona.edu. 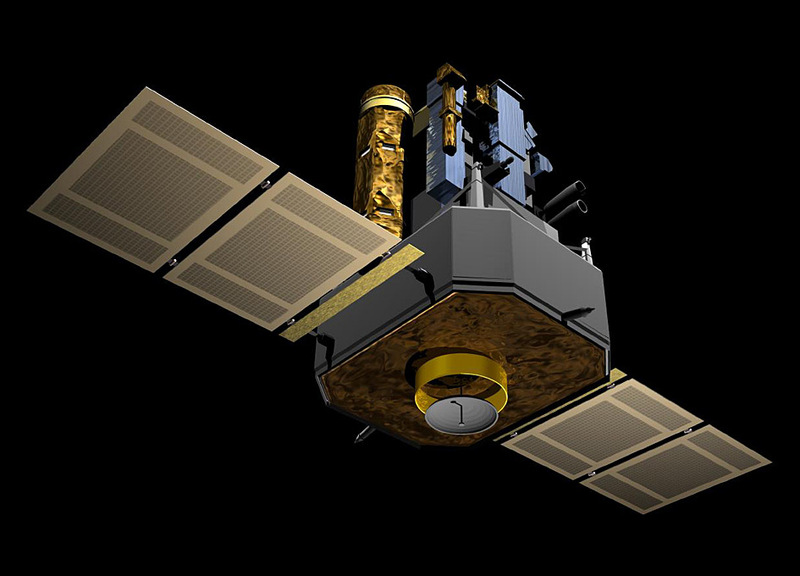 Artist’s concept of the Akatsuki spacecraft. 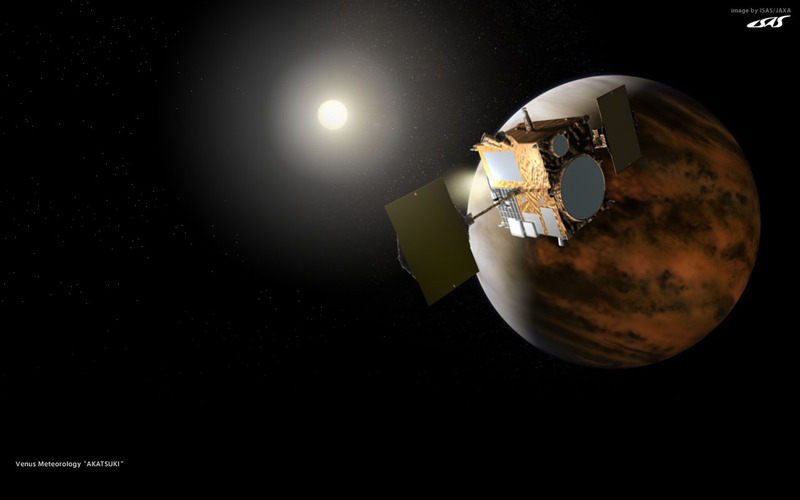 Four maneuvering thrusters were scheduled to ignite at 2351 GMT (6:51 p.m. EST) Sunday for approximately 20 minutes and 30 seconds to slow down the Akatsuki probe enough for Venus’ gravity to capture it into an elongated, high-altitude orbit. Akatsuki was never designed to fire its secondary attitude control rocket jets for such a long time, but the thrusters were required to steer the craft into orbit after its main engine failed during the mission’s first encounter with Venus exactly five years ago. Officials confirmed the burn went as planned early Monday. “It is in orbit!” wrote Sanjay Limaye, a planetary scientist based at the University of Wisconsin in Madison, in an email to Spaceflight Now. “They were cautiously optimistic before the burn, but confident. Now smiling!” reported Limaye from Akatsuki’s mission control center in Sagamihara, Japan. 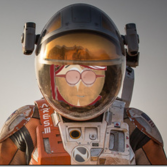 He is is a NASA-sponsored participating scientist on the Akatsuki mission. 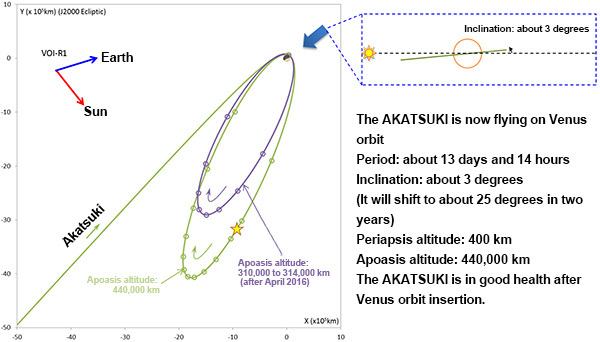 It could take a few days to precisely measure Akatsuki’s trajectory to verify it is in the proper orbit around Venus, officials said. Olympus Mons is the largest volcano in the solar systems. The altitude of Olympus Mons is nearly three times the altitude of the largest peak on Earth, Mt.Everest. 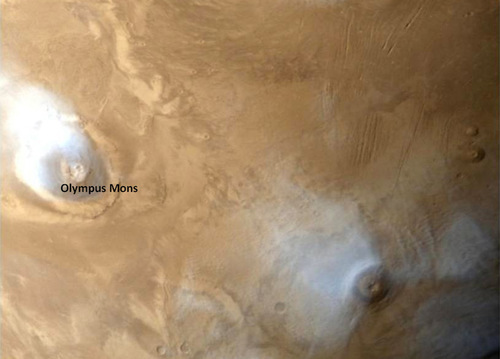 Water vapor clouds are seen around mons top which is a usual phenomenon during this season in Mars. This image is taken by MCC on November 27, 2015 at an altitude of 32,282 km with a resolution of 1679 m.
When NASA's Juno mission arrives at Jupiter on July 4, 2016, new views of the giant planet's swirling clouds will be sent back to Earth, courtesy of its color camera, called JunoCam. But unlike previous space missions, professional scientists will not be the ones producing the processed views, or even choosing which images to capture. Instead, the public will act as a virtual imaging team, participating in key steps of the process, from identifying features of interest to sharing the finished images online. Look at that fresh debris on the moon! It’s the result of a smack-down from a rocket that left Earth 44 years ago, carrying the Apollo 16 astronauts to the lunar surface. What you’re looking at is a new Lunar Reconnaissance Orbiter discovery image that finally shows the remains of a part of the Saturn V rocket that hefted John Young, Charlie Duke and Ken Mattingly towards the moon in 1972. This is the third stage of the rocket, called the Saturn IVB. Its role was to propel the astronauts out of Earth orbit and towards the moon. Starting with failed moon mission Apollo 13 in 1970, NASA directed the Saturn IVBs to impact the moon. The energy of the impacts were measured by seismometers the astronauts left on the moon, to reveal more about the moon’s inner structure. “Earlier in the LRO mission, the Apollo 13, 14, 15 and 17 impact sites were successfully identified, but Apollo 16′s remained elusive. 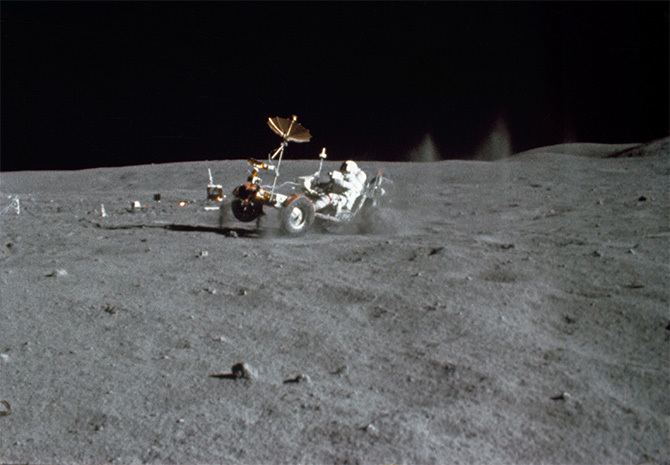 In the case of Apollo 16, radio contact with the booster was lost before the impact, so the location was only poorly known,” NASA wrote in a statement. LRO, which has been orbiting the moon since 2009, has now imaged all of the Apollo landing sites and booster impact sites. 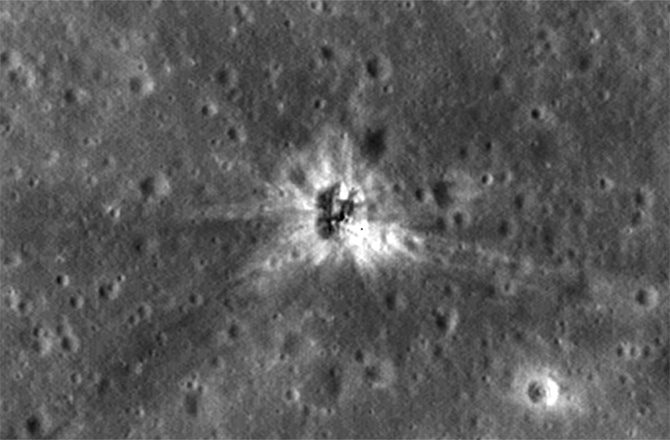 The site of the Apollo 16 rocket booster impact on the moon, in Mare Insularum. Views like this are impossible from Earth, where we only see Saturn's moons as (more or less) fully illuminated disks. 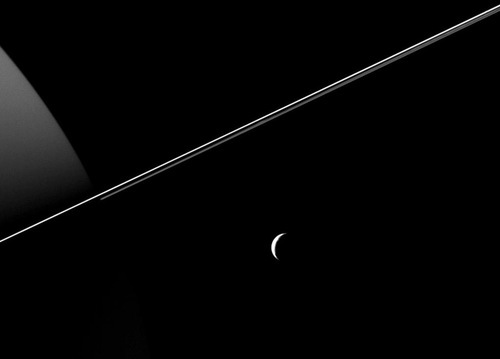 The region of Saturn seen at left is on the planet's night side. 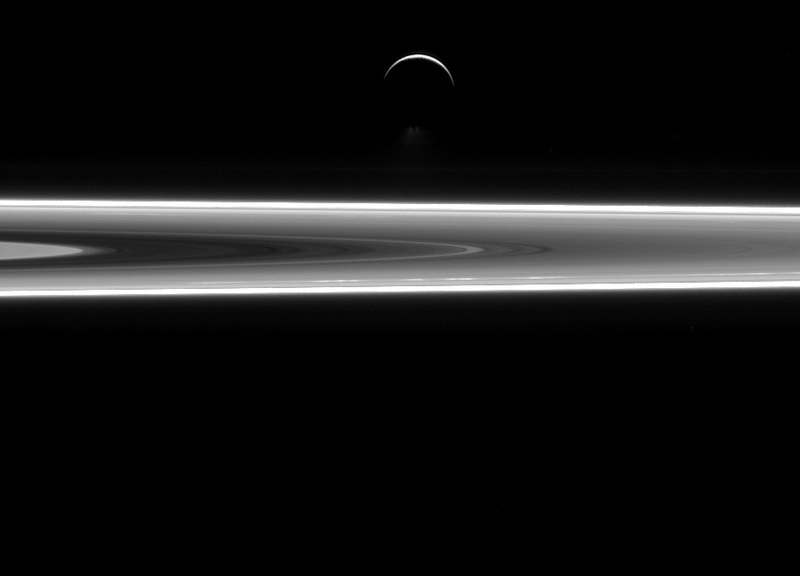 Reflected light from the rings dimly illuminates the planet's northern hemisphere. This view looks toward the anti-Saturn side of Tethys. North on Tethys is up and rotated 24 degrees to the left. The image was taken in visible light with the Cassini spacecraft wide-angle camera on Aug. 18, 2015. 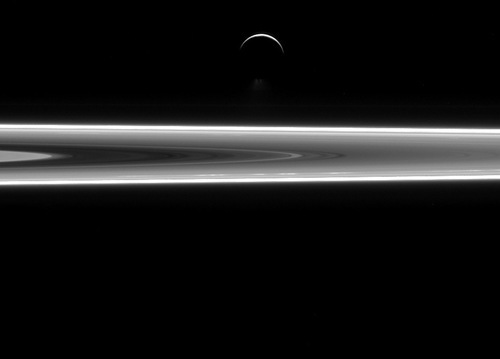 The view was acquired at a distance of approximately 184,000 miles (296,000 kilometers) from Tethys. Image scale is 11 miles (18 kilometers) per pixel. HMP started in 1997 and has been hosting NASA-supported research each year since then. The rocky, barren terrain of Devon Island offers many challenges, from remoteness and isolation to extreme temperatures and lack of infrastructure. "The way I envision it, Devon Island will eventually become a training site for astronauts bound forMars," he said. "It will become one of the imperative stops, if not the final stop, in your preparation for the Red Planet." The first paragraph is a bit of a play on words, as "locals" do inhabit the island, just not "full time" habitation. The Japanese space agency — JAXA — also confirmed Akatsuki is in a good orbit around Venus after a 20-minute firing of four of the spacecraft’s maneuvering thrusters beginning at 2351 GMT (6:51 p.m. EST) Sunday. Engineers said Monday the make-or-break rocket burn appeared to go as planned, but it took two days for ground stations to carefully monitor Akatsuki’s trajectory and verify the parameters of its orbit. The thruster firing placed Akatsuki in an elongated elliptical orbit ranging as far as 440,000 kilometers (273,000 miles) from Venus. At the low point of its orbit, Akatsuki passes about 400 kilometers (248 miles) above the planet, JAXA officials said Wednesday. The orbit is slightly lower than anticipated, an indication that the maneuver outperformed expectations, generating extra impulse to drive Akatsuki on a path closer to Venus, officials said. In other Cassini imaging neews, the spacecraft captured a unique close up view of Saturn's moon Epimetheus (116 kilometers, or 72 miles across) during a moderately close flyby on Dec. 6, 2015. This is one of Cassini's highest resolution views of the small moon, along with PIA09813. This view looks toward the Saturn facing side of Epimetheus. 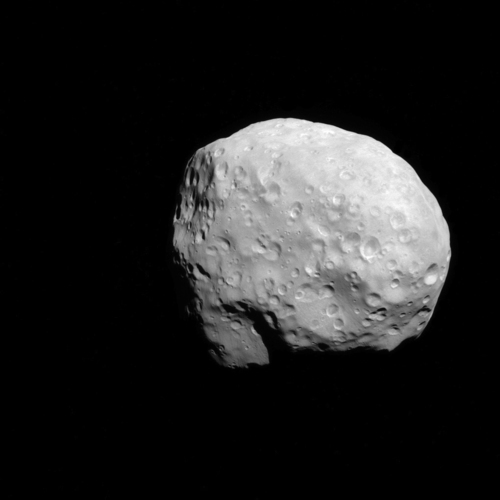 North on Epimetheus is up. 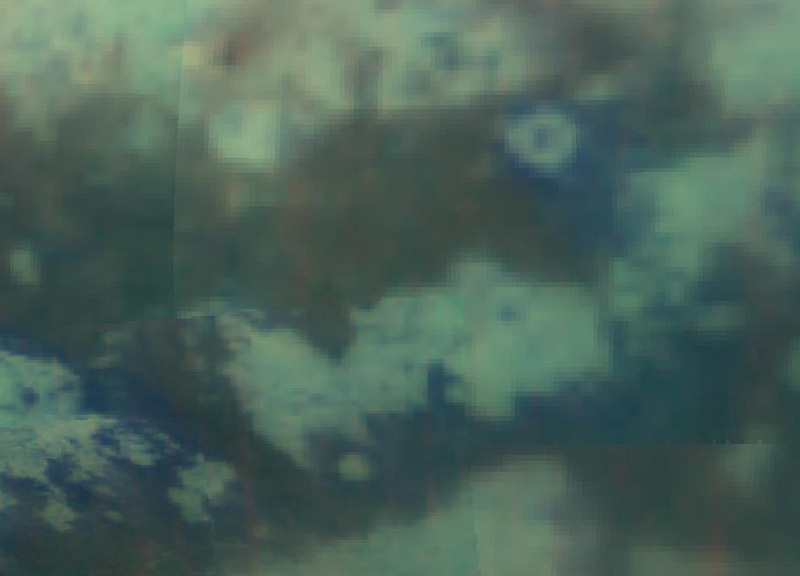 The image was taken in green polarized light with the Cassini spacecraft narrow-angle camera. 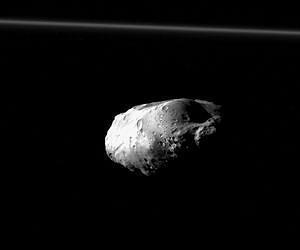 The view was acquired at a distance of approximately 22,000 miles (35,000 kilometers) from Epimetheus and at a Sun-Epimetheus-spacecraft, or phase, angle of 28 degrees. Image scale is 697 feet (212 meters) per pixel. Makes perfect sense. Take a salt-enriched global ocean, with a (likely tenuous but still-capable) atmosphere around Ceres (in the beginning, like Mars), then whittle away that atmosphere. The H2O component subliminates, leaving the much heavier Sodium products that were once-locked in the water behind, and this is what we'd see. Wonderful science returns this year from NASA. Ceres Rotation and Occator Crater, video is 1:12 min. 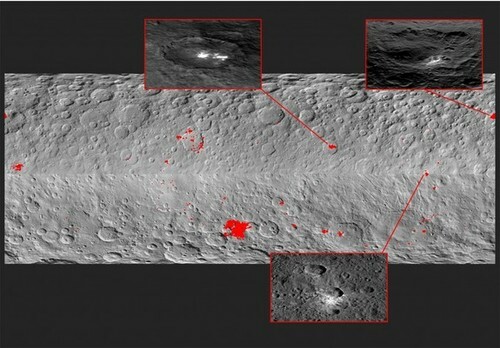 The dwarf planet Ceres turns out to be a world with untold wonders, with vivid bright spots likely made of dried mineral salts and hazes apparently triggered by daytime heating, drawing a comparison to comets and strikingly differentiating it from neighboring bodies in the asteroid belt, according to the latest results from NASA’s Dawn mission. The fresh findings on Ceres, detailed in two papers published in Nature magazine this week, offer new insights into the king of the asteroid belt, just as NASA’s Dawn spacecraft reaches its final planned science orbit 240 miles, or 385 kilometers, from Ceres’ cratered surface. Dawn’s discoveries point to a landscape on Ceres marked with bright features that piqued the interest of scientists as the space probe approached the dwarf planet early this year, raising speculation among observers that they could be ice deposits or even evidence of cryovolcanism. Scientists said Wednesday the most likely explanation is they are salts left behind as water ice exposed by asteroid impacts sublimated into space, a process in which volatile compounds like ice turn directly from a solid to gaseous state, skipping over the liquid phase. 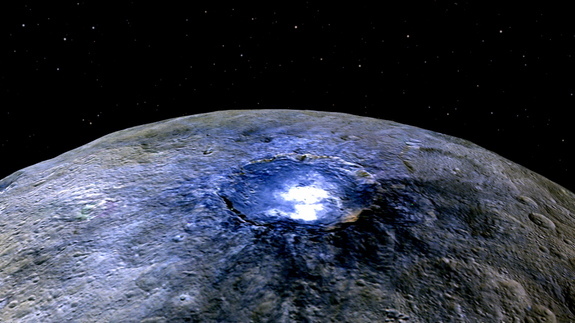 “The most plausible interpretation of our results is that there is a mixture of ice and salts under at least some parts of Ceres’ surface,” said Andreas Nathues, principal investigator for Dawn’s framing camera from the Max Planck Institute for Solar System Research in Göttingen, Germany. 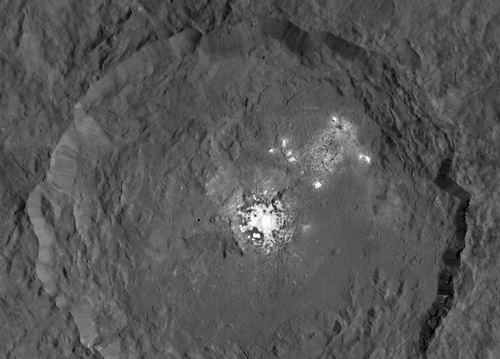 Researchers analyzing images from the Dawn spacecraft identified more than 130 bright areas on Ceres, according to a NASA press release. The light reflected by the material making up the bright spots is more blue than light from other regions, scientists said, leading members of Dawn’s science team to conclude it is likely a type of magnesium sulfate called hexahydrite, similar to Epsom salt on Earth. “Comparisons with a large variety of materials which we examined in the laboratory indicate that among other materials hydrated magnesium sulphates are to be found there,” said Martin Hoffman, a co-author on one of the papers in Nature with lead author Nathues. Ceres is the largest object in the asteroid belt between the orbits of Mars and Jupiter, accounting for about a third of the belt’s total mass. 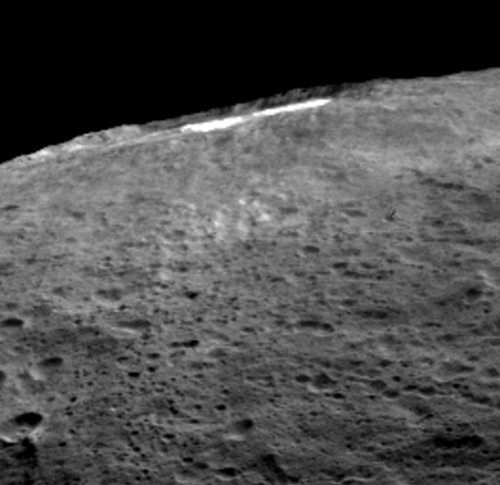 Ceres has a diameter about the same as the width of France, and its surface temperatures range from minus 136 degrees to minus 28 degrees Fahrenheit (180 to 240 Kelvin) in sunlight. Wow. Fascinating if it's true; but they plainly admit that it could be another Ice Body like Pluto and Sedna. They just aren't sure yet. I'm curious to know what kind of atmosphere or geological activity an earth-like planet could have at that distance from a star if it is indeed an earth-like planet.